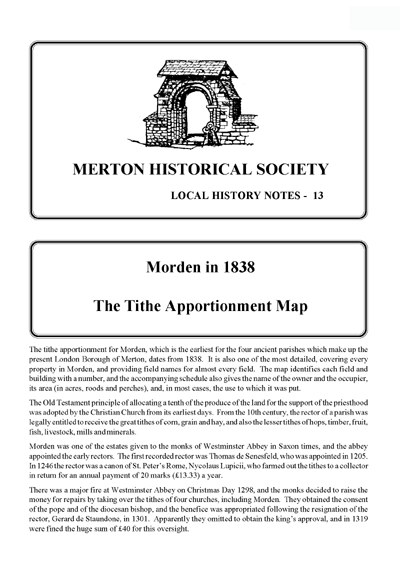 The tithe apportionment for Morden, which is the earliest for the four ancient parishes which make up the present London Borough of Merton, dates from 1838. It is also one of the most detailed, covering every property in Morden, and providing field names for almost every field. The map identifies each field and building with a number, and the accompanying schedule also gives the name of the owner and the occupier, its area (in acres, roods and perches), and, in most cases, the use to which it was put. This edition follows the original apportionment by listing landowners alphabetically, with the lands then arranged by occupants. A much-reduced copy of the map is reproduced on the centre pages, followed by a series of extracts, at the original scale, covering the main residential areas. This is followed by an index in numerical order, giving owners and occupiers. Extracts from Robson’s Commercial Directory of 1838 and Pigot’s Directory of 1839 have also been included to provide further information on the various individuals mentioned in the apportionment. Finally some small-scale maps are included to show the various estates of the landowners and tenants, and the use to which the land was put. The Old Testament principle of allocating a tenth of the produce of the land for the support of the priesthood was adopted by the Christian Church from its earliest days. From the 10th century, the rector of a parish was legally entitled to receive the great tithes of corn, grain and hay, and also the lesser tithes of hops, timber, fruit, fish, livestock, mills and minerals. Morden was one of the estates given to the monks of Westminster Abbey in Saxon times, and the abbey appointed the early rectors. The first recorded rector was Thomas de Senesfeld, who was appointed in 1205. In 1246 the rector was a canon of St. Peter’s Rome, Nycolaus Lupicii, who farmed out the tithes to a collector in return for an annual payment of 20 marks (£13.33) a year. There was a major fire at Westminster Abbey on Christmas Day 1298, and the monks decided to raise the money for repairs by taking over the tithes of four churches, including Morden. They obtained the consent of the pope and of the diocesan bishop, and the benefice was appropriated following the resignation of the rector, Gerard de Staundone, in 1301. Apparently they omitted to obtain the king’s approval, and in 1319 were fined the huge sum of £40 for this oversight. Likewise the tithes of the watermill, and all offerings of the altar and all kinds of oblations in any way accruing to the church either in masses or in confessions, and all legacies in wills, and all small tithes in any way belonging to the church. Likewise 13 acres of arable land and half an acre of meadow, and the whole tithe of hay off the said parish, and a quarter of wheat and a quarter of beans from the said monks, and all ordinary charges incumbent on the church. The remaining tithes went to the abbey, though during the 14th and 15th centuries they were leased to ‘farmers’, who paid a fixed sum or ‘farm’ each year and then kept whatever tithes they were able to collect. When the manor was sold after the Dissolution of the Monasteries, the tithes became the property of the lord of the manor, who was known as the “lay rector”. From 1554 the Garth family owned the estate, though the abbey’s farmer remained in possession until 1556. There was a major lawsuit between one of the vicars, Francis Medcalf, and the lord of the manor, Richard Garth, around 1584 to 1591, of which records survive in Surrey Record Office and at the Public Record Office. Richard Garth’s right to the tithes was established, but the vicar, who was deprived of his post, continued to contest the case, and was committed to the Fleet prison for non-payment of costs! In 1631 the elderly vicar, William Awdrey, was persuaded to share his ministry with William Booth. The lord of the manor, Richard Garth II, transferred all the rectorial tithes to William Booth in July 1631, and when William Awdrey retired in 1634 William Booth was nominated rector of Morden. So after more than 300 years, the tithes were once more the property of the parson of Morden. William Booth married Richard Garth’s sister in 1635, having buried her first husband in 1634, and his successor as rector, Edward, son of John Booth, married the daughter of another of Garth’s sisters. It was not until the beginning of the 19th century that the question of commutation of tithes for a fixed sum of money received serious consideration. This was a period of reform, both in politics and within the Church of England. No doubt the agrarian improvement during the 18th and early 19th centuries added impetus to the call for change, especially following on from the success of the enclosure movement. In a period of agricultural depression, the tithes were seen as a heavy burden on food producers, and landowners claimed that heavy tithe demands prevented them paying their labourers the higher wages they were demanding. They were also resented by Non-conformists and Roman Catholics. At first, commutation in a particular parish was only to take place if agreed by the landowners, the tithe owners and the diocesan bishop. The Times observed in 1834, “All men of all parties express the most anxious desire to see the tithe question set at rest.” Various attempts to solve the problem were made in Parliament, and at last the Tithe Commutation Act received the Royal Assent on 13th August 1836. Three tithe commissioners were appointed, two by the government and one by the Archbishop of Canterbury. The commissioners appointed assistant commissioners to undertake the work locally. Most assistants had been land agents or valuers, many had been active as enclosure commissioners. They had the power to confirm voluntary agreements and to frame compulsory agreements. Their decisions were subject to the usual appeals at law, though this was seldom invoked, as disputes were usually settled locally. The tithe values were converted into rent charge payments by assuming that each sum had been used to purchase equal quantities of wheat, barley and oats at prices published annually in the London Gazette. The Morden award, by Francis Fuller of Croydon, dated 31st December 1838, shows that the total annual rent charge awarded to the rector, the Revd. Robert Tritton, amounted to £425 “for all tithes, great and small, including £5 for the rectorial great tithes of the glebe land and the vicarial small tithes”. The actual total of the lands listed in the schedule, which included residential property exempt from tithe, amounted to 1422 acres 3 roods 1 perch. (It is worth noting here that 1 acre was the equivalent of 4 roods. 1 rood was the equivalent of 40 perches). Various amendments were made to the apportionment of rent charge over the years, as land was used for railways and later for housing. Copies of these are filed with the photostats of the tithe apportionment kept in Merton Local Studies Centre. Also in the archives at the Centre is a manuscript book of ‘References to the Morden Tithe Plan numerically arranged’, dating from 1892, in which was recorded the date, between 1927 and 1936, on which the tithes were redeemed when the land was sold for housing development. The 1836 Tithe Commutation Act remained the essential statement on rent-charge conversion until 1936, when rent charges were replaced by annuities to be paid by landowners over a period of 60 years, which would finally redeem all tithe by 1996. Thus tithes are now a thing of the past, but the maps and schedules which accompanied the commutation of tithes remain an important source for the study of local history. The following pages follow the original apportionment by listing landowners alphabetically, with the lands then arranged by occupants. A much reduced copy of the map is reproduced on the centre pages, followed by a series of extracts, at the original scale, covering the main residential areas. This is followed by an index in numerical order, giving owners and occupiers. The bulk of the property was owned by the Revd. Richard Garth, the lord of the manor of Morden. However, a considerable portion of the parish was not within the manor of Morden, but had for many centuries been part of the manor of Ravensbury, which also extended into Mitcham, and was held at this date by Charles Hallowell Carew. Extracts from Robson’s Commercial Directory of 1838 and Pigot’s Directory of 1839 have also been included to provide further information on the various individuals mentioned in the apportionment. The directories have given rise to a certain amount of confusion in relation to property known as Morden Lodge. They both use this name for the property of George Matthew Hoare (plots 271-288) formerly in the possession of Merton Priory, shown on the Greenwoods’ map of 1822-23 as Spital Farm, and on the Ordnance Survey maps of the 1860s as The Lodge in Farm Road. The latter map shows that Morden Lodge adjoined Morden Hall, and was the estate held by Richard Jones in 1838 (plot 355). The house, still known as Morden Lodge, replaced one of the same name belonging to financier Abraham Goldsmid from 1803 to 1810, built close to the site of the Tudor manor house known as Growtes. Finally some small scale maps are included to show the various estates of the landowners and tenants, and the use to which the land was put. Chambers, Lancelot, esq. 240, &c.
Hoare, George M. esq. Morden lodge [The Lodge] 275, &c.
Ridge, George, esq. Morden park 148, &c.
Tritton, Rev. John 350, &c.
boot & shoe maker ? snuff & tobacco manufacturer 305, &c.
snuff & tobacco manufacturer 370, &c.
tavern /public house 179, &c.
Pigot’s directory covers Mitcham, Merton, Morden, and Wimbledon, listing people alphabetically by their profession. These extracts for Morden have been rearranged by surname, to enable comparison with Robson’s directory. courtesy of Merton Libraries and Heritage Services. This entry was posted in Publications, Local History Notes and tagged in 19-century Morden, lhn, morden, tithe, transcript.